Published: Dec. 27, 2016 at 01:02 p.m. Updated: Dec. 27, 2016 at 04:34 p.m.
Rex Ryan's sudden firing on Tuesday means plenty of change ahead for the Buffalo Bills -- starting with the team's most important position. NFL Network Insider Ian Rapoport reported that quarterback Tyrod Taylor is expected to be benched in favor of backup EJ Manuel for Sunday's season finale against the New York Jets, per team sources. The Week 17 start would serve as a tryout of sorts for Manuel heading into 2017. That wouldn't have happened under Ryan, who operated as a primary proponent of Taylor and fought to keep him under center, per Rapoport, who added that the coach's firing is "bad news" for the quarterback. The decision also hovers squarely around money, with Taylor's remaining contract -- a hefty $30.75 million in full -- becoming fully guaranteed if he were to go down with a major injury on Sunday. 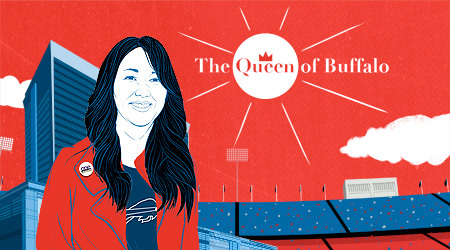 How did Kim Pegula become a guiding light for the Bills and a powerful force for Buffalo? Michael Silver documents her surreal path from an orphanage to NFL owners' meetings. Instead of falling into an unwanted financial commitment, the Bills under interim coach -- and possibly future coach -- Anthony Lynn will use Week 17 as a chance to assess Manuel, the former first-round pick who will hit free agency in the offseason. Ryan's backing of Taylor certainly played a role in his premature dismissal, allowing un-killable general manager Doug Whaley to sit Taylor and get one more look at the quarterback he whiffed on in the 2013 NFL Draft. Everything we've seen from Taylor -- coming off one of his best games -- suggests a more athletic, accurate and exciting answer under center. Buffalo's front office, though, isn't ready to shake their ridiculous fascination with the mundane Manuel. That leaves Buffalo's long-suffering fan base clinging to an operation still searching for a head coach and a franchise quarterback. Some things never change.